BioTerra Cellulosics “BSE Organic Hydro-Seeding Fiber Mulch” is not low grade paper mulch but a proprietary blend of high performance organic cellulosic fibers. BSE is the most natural, perfectly balanced and functionally diverse fiber mulch to ever be produced. BSE is a high performance fiber mulch with the highest water retention capability and lowest sodium content of any hydro-seeding fiber mulch. BSE retains more water than straw, paper mulch or wood fiber mulch. BSE organic hydro-seeding fiber mulch provides superior coverage, retains 10 times its weight in water, possess a perfectly balanced pH of 6.9 to 7.4 and is functionally sodium free with only trace sodium residuals. BSE organic fiber mulch accelerates the growing process by retaining more moisture around the seeds providing a far higher rate of germination than paper mulch or paper hydro materials. BSE makes equipment loading easy and fast due to its small fiber make-up and ultra-fast water absorption. 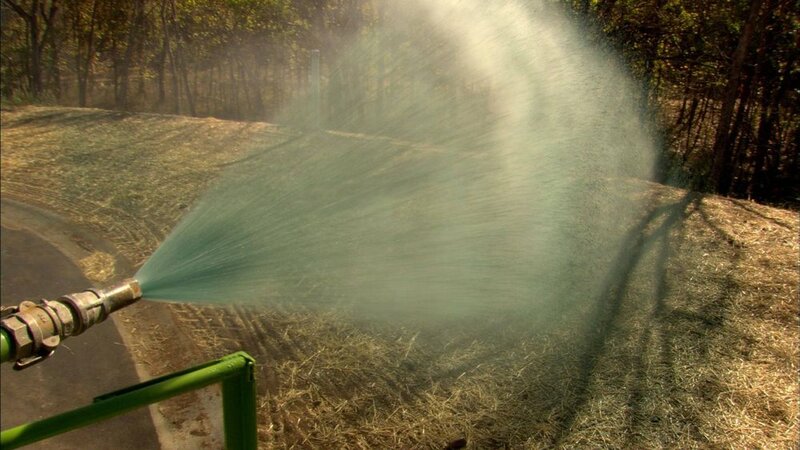 It is dust free, pours easily in to hydro-seeding equipment and is weed free. With functionally zero sodium, no added nutrients, fertilizers or additives, BSE allows you TOTAL nutrient control of every hydro-seeding project. BSE is the most environmentally responsible soil amendment to exist. 100% Produced in the USA, BSE is a proprietary organic hydro-seeding fiber mulch that is 100% natural, 100% sustainable and 100% biodegradable.